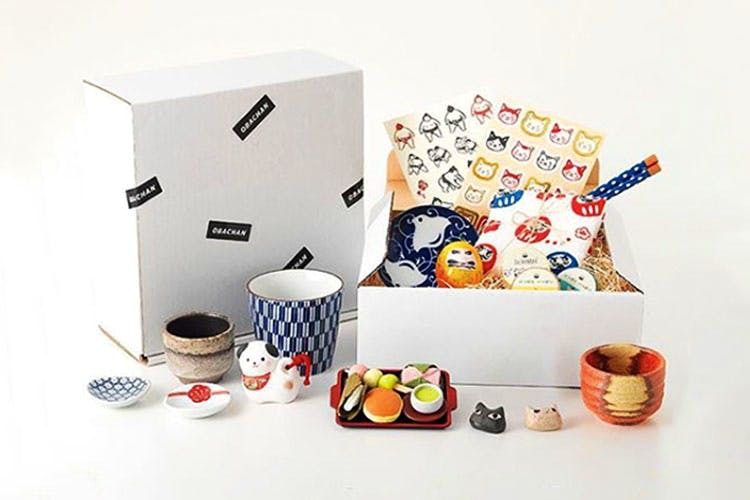 Obachan is a monthly Japanese subscription box that gets delivered to your doorstep every month. What sets it apart is the funky curation of textiles, decor, stationery and eats that are handpicked by the curators in Tokyo. We’ve been obsessed with Japanese aesthetic for as long as we can remember. We could barely get over MUJI and Yoku Moku came around holding its cigar rolls and now, we’re nurturing a full-blown love affair with this subscription box. Well, would you blame us if we told you that it had 5–7 goodies, all bought from Japan? Think pen brushes and masking tapes to soup bowls and chopsticks and even bowties and a stash of local candy (OMG sour candy and crazy Kit Kat flavours!). Their traditional ceramics and adorable collectibles have a piece of our heart. We’re also hoping we get cool fabrics like this one in our mystery box sometime to make sleeping shorts. And please, just stop our crazy heart from drooling on these towels. Call us cynics (scarred by ever-failing deliveries from Ali Express) but we had to check on these good folks’ shipping process and delivery. So, we pinged them on Instagram at 8am and believe it or not, we got clipped, specific replies to all our questions in 5mins of the message reaching them. The conversation was easy and the one-line answers were as precise as they get. In fact, they’ve already shipped a bunch of boxes to India successfully (back off, customs). A single box is priced at INR 3,340 including shipping but the cost comes down if you subscribe monthly. Through the course of our chat, we figured that they ship the box through Japan Mail and have a robust tracking system to ensure your parcel reaches you safe and sound (no harm will come to this sushi eraser, yay!). They send out deliveries between the 20th and 30th of every month and typically, it takes a week to 12 days for it arrive. P.S. You can’t customise the contents in the box but hey, what’s the fun when you know what you’re getting anyway?